The world's longest-established Chicana Chicano, Latina Latino literary blog. Thank you for your comments about my posts. Now I have a new day, los miércoles. Keep reading and look for my posts every Wednesday. And following Manuel Ramos' post, these are the new bilingual children's books from Piñata Books, an imprint of Arte Público Press. 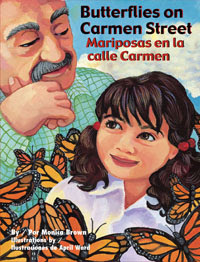 “Today is Butterfly Day!” Julianita excitedly tells her grandfather as they make their way down Carmen Street to school one morning. Today is the day Julianita and her friends have been waiting for—they’re going to learn about monarch butterflies. But what’s even more thrilling is they’re each going to receive their very own caterpillar to raise! When Julianita gets hers, she names him Tiger because of his striking yellow and black stripes. Ms. Rodríguez teaches her students all about the monarch. But Julianita already knows that they fly south thousands of miles every winter because her grandfather remembers seeing the beautiful monarchs in his village in the highlands of Mexico. As the children feed and care for their caterpillars, they anxiously anticipate the transformation from caterpillar to chrysalis to butterfly. When Tiger finally emerges from his chrysalis, Julianita doesn’t want to let him go. She worries that he will get lost on his way to Mexico. “Tiger knows the way to Mexico because it’s in his heart,” her Abuelito reassures her. She feels sad to see Tiger fly away, but Julianita knows that someday, she will follow him to her grandfather’s magical Mexico. Paired with April Ward’s charming illustrations that depict Julianita’s neighborhood—her home on Carmen Street, the bench where Abuelito rests in Palo Verde Park, her parents’ store that sells everything in the whole wide world—this book by award-winning author Monica Brown is sure to entertain and educate kids ages 3-9. This is a perfect choice for children learning about insects and the forces of nature. Ricardo Romo never dreamed that running to catch the school bus would lead to a college education, and ultimately, to a long and respected career as a teacher, administrator, and university president. He grew up in San Antonio, Texas, the son of Mexican immigrants, and worked in his family’s small grocery store, where he learned to work hard and respect his family and neighbors. In school he learned that, as a Latino, he was expected to go to the technical high school rather than the one that prepared students for college, yet his teachers and coaches encouraged him to pursue his studies. They also fostered his natural athletic abilities as a runner. 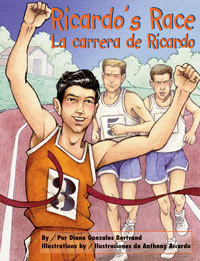 In high school, Ricardo set numerous records in track and cross country, including the country’s second fastest recorded mile at that time. While still a sophomore, he began to receive invitations from colleges and universities urging him to consider running for their schools. Ultimately, he went on to run for the University of Texas at Austin, where he graduated with an undergraduate degree in history. While injuries ended Ricardo’s hopes of competing in the 1968 Olympics, his educational dreams were achieved when he obtained a master’s degree from California State University, Northridge and a Ph.D. from the University of California at Los Angeles, both in history. Currently, he is the president of the University of Texas at San Antonio, and a time line detailing Dr. Romo’s accomplishments as an athlete and a scholar is included. Award-winning author Diane Gonzales Bertrand presents an inspirational biography of this All American’s quest to accomplish his goals. With vivid, realistic illustrations by Anthony Accardo, emerging readers will be inspired to discover their own talents and chase their dreams. Cousins are friends and rivals. Cousins are funny and frustrating. But the most important thing is that cousins are family. 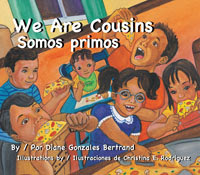 We are Cousins / Somos primos celebrates the joy of this special family bond. The children explain that they are cousins because their mothers are sisters, and from the moment they get together, the fun begins. They march in a make-believe parade, gobble up a pizza, and share a cozy story on Abuelo’s lap. But they also blame each other if something goes wrong, don’t want to share their toys, and wiggle against each other to nab a spot on Abuela’s lap. 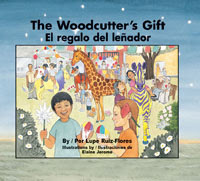 Written in simple language for children ages 3-5, the brief English and Spanish text will become a valuable tool to encourage children to think and talk about their own families. It will also become a favorite book for children and grandchildren to share with their parents, grandparents, aunts, uncles, and of course, cousins. Vivid illustrations by Christina Rodriguez in bright, primary colors complement this story that will be as much fun to read at story hour as it will be to read on the family sofa. One day, a terrible thunderstorm knocked down the giant mesquite tree that grew in the town square. After the storm, the townspeople gathered to gawk at the large obstruction blocking the street. They weren’t sure what to do with it, but they all agreed that the wood was good for nothing except a fire. But the woodcutter Tomás sees something in the huge tree that the rest of the townsfolk don’t. “The beauty of this tree is not on the outside but on the inside,” Tomás tells them. In the following days, everyone watches curiously as the woodcutter carves and chips and whittles the wood into blocks. At one point, he moves the chunks into his shed, increasing everyone’s curiosity. What could the woodcutter be doing with all that lumber? Finally, Tomás calls the townsfolk together to see his creations: a wonderful collection of life-sized animals for the children to enjoy. Children and adults alike are thrilled with their private zoo! But a few weeks later the woodcutter is visited by strangers from a folk art museum who want to buy the pieces for their collection. Will Tomás sell the town’s new zoo animals so that others can enjoy them too? Everyone loves the taste of the puffed pillows of fried bread known as sopaipillas, whether they’re drizzled with honey or sprinkled with cinnamon and sugar. But most people, young Cristina included, don’t know about this Southwestern treat’s magical origins, or how it got its name. One hot summer morning, Cristina’s abuelita promises to teach her how to make the tasty fried bread and explain how she knows that making sopaipillas will bring rain! Long ago, Cristina’s great-grandfather Benito was desperate. His crops were dying because it hadn’t rained for months. One day, exhausted and weak from working the fields, Benito watched in amazement as a scarecrow came to life and begged him to help bring rain. The worried scarecrow claimed to know how. But could a scarecrow—and pieces of dough—really bring rain to the dry and dusty fields? Could Benito really save everyone’s crops? And so Benito—and many years later his great-granddaughter Cristina—learned about the pillows of bread known as “soup catchers” that, like clouds, catch rain drops and bring them down to earth. 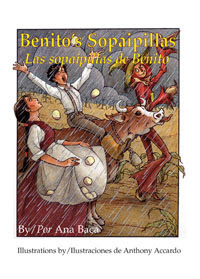 Benito’s Sopaipillas / Las sopaipillas de Benito is a magical bilingual picture book for children aged 3-7 that celebrates a delicious staple of Southwestern cuisine. And for those children who want to test the magic of the sopaipillas, a recipe is included in English and Spanish. Like most young children, Mimí loves Christmas time, so much so that she doesn’t even mind the bitter cold. But while her friends plan to ask for skates, sleds, coats and boots for Christmas, Mimí wants a straw hat, new sandals, a polka-dot bathing suit, and maybe even a beach ball. She’ll need toys and clothing for warm weather because she goes to Puerto Rico every Christmas, and she can’t wait to go again this year! Mimí especially looks forward to her annual parranda, the Puerto Rican version of Christmas caroling. She loves it when everyone arrives late at night and wakes her up by playing their instruments—güiros, palitos, maracas, guitars, tambourines. And the food … she dreams about a table brimming with all her favorites: roasted pork, pasteles, and arroz con leche. But when she learns that her family won’t be able to go to Puerto Rico this year, Mimí is crushed. She is so sad that she loses interest in her class’s holiday party, and on the day of the party, she decides to stay home in bed. Just as Mimí is falling asleep, though, she hears the unmistakable sounds of musical instruments. Could it be that she’ll get her parranda after all? 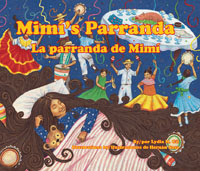 Rich with Puerto Rican cultural traditions and complemented by vibrant illustrations, Mimí’s Parranda / La parranda de Mimí will have children ages 3-7 eagerly anticipating their own holiday traditions. 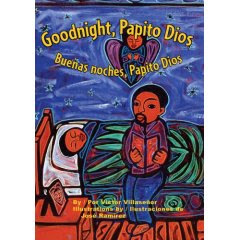 Everyone knows that the trick to putting children to bed is creating a bedtime routine, and in this new children’s story from Victor Villaseñor, he recreates his own family’s bedtime tradition. As Papá sings the turtledove song to his son, he reminds the child that Mamá loves him, the dog and the cat love him, and his brothers and sisters love him too. Even the trees and grass and the flowers that dance in the wind love him. Gradually, the boy drifts off to sleep, feeling safe and warm in God’s love and dreaming of the day when he will sing the turtledove song to his own children. A fine post to mark your move over to Wednesday's on La Bloga, René. If my school doesn't have these, I'm getting at least three of them. Gracias por los artículos que hiciste por tantos sábados. Bienvenido al miércoles. Hola Rene. Te leere los miercoles entonces. Un placer conocerte en S.A.
Adios, Gina Marysol Ruiz. Bloguera, Farewell. Type your email to read La Bloga in your Inbox• Please include us in your "Approved Senders" List. © Each respective author. All rights reserved. Watermark theme. Powered by Blogger.